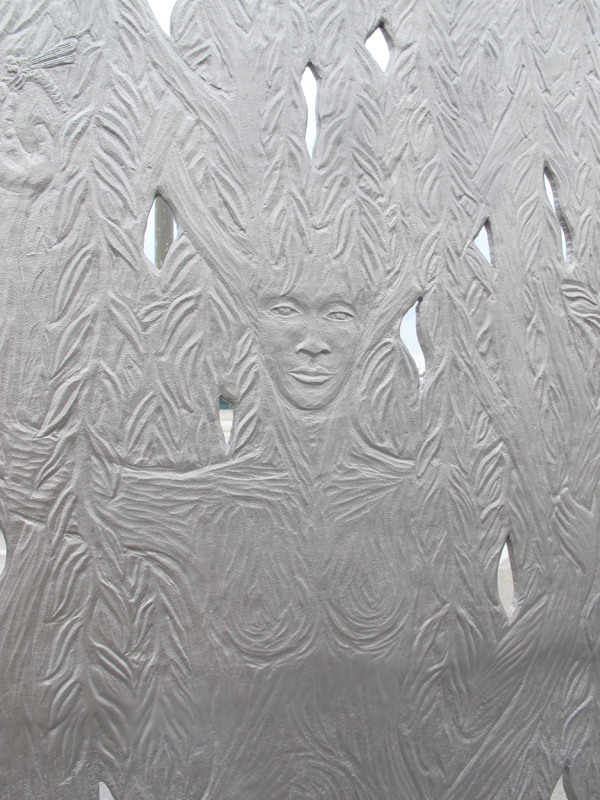 Detail of Paraje—Spanish for a resting place between two destinations—a 10ft h x 10ft w cast stainless steel sculpture containing imagery inspired by the nearby Gardena Willows Wetlands. Preserve. 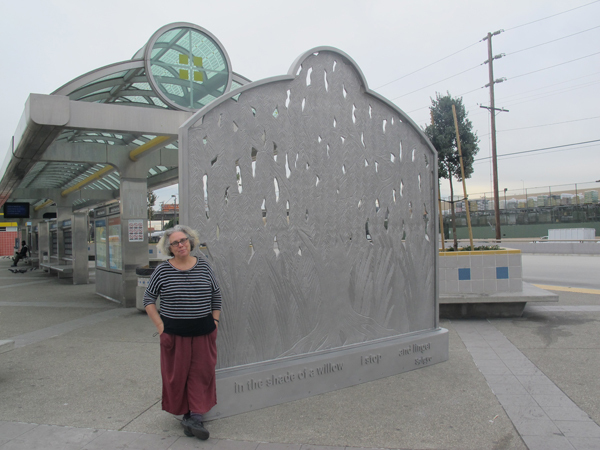 A new sculpture by Alison Saar is now installed at Artesia Transit Center (currently in transition to being renamed Harbor Gateway Transit Center). 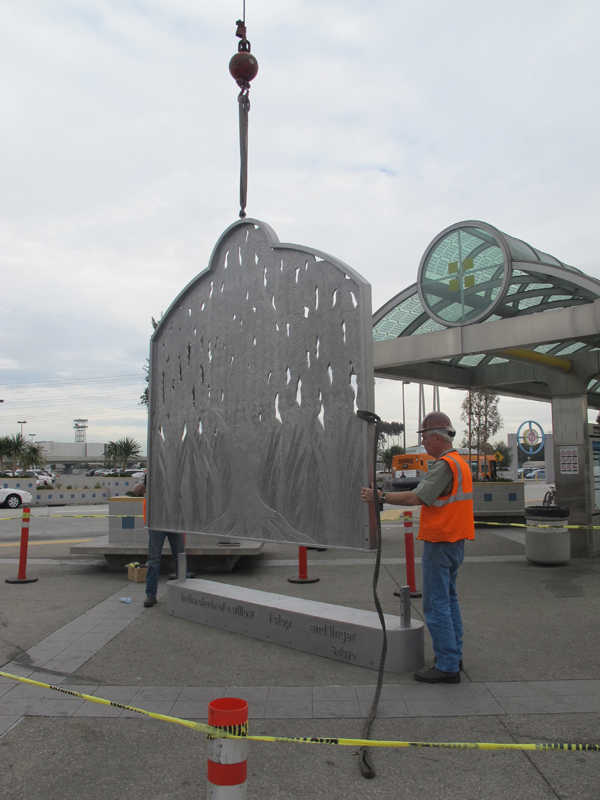 Entitled Paraje — Spanish for a resting place between two destinations — the cast stainless steel sculpture contains imagery inspired by the nearby Gardena Willows Wetlands Preserve. 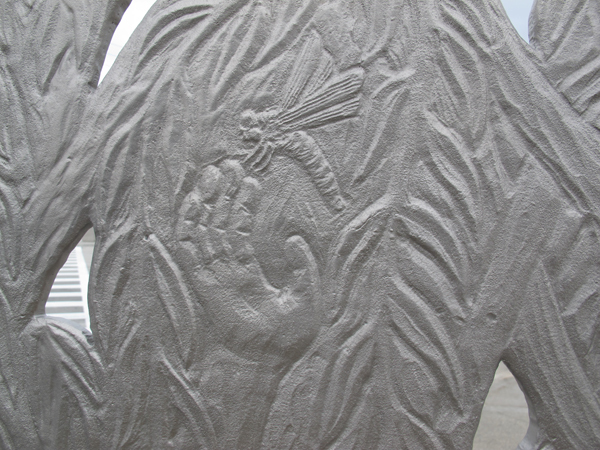 Saar’s sculpture was commissioned by Metro’s art program as part of a broad series of Metro improvements to the station’s physical environment. Other improvements include enhanced station lighting, upgraded wayfinding signage and new CCTVs and digital message signs. Scroll below for photos documenting the installation of the sculpture. Click here for a previous Source post about the artwork. 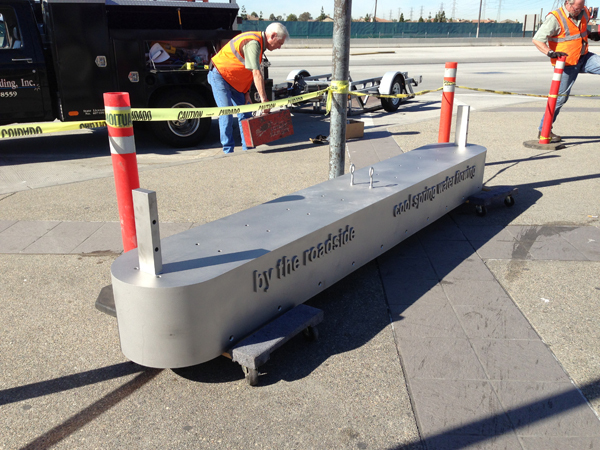 The 12-inch high stainless steel base of the sculpture shown just before it is installed. The base contains a quote by Japanese poet Saigo. The artist, Alison Saar, after her sculpture has been installed. Detail of Paraje. The sculpture’s west face depicts a willow tree, while on the east face a willow spirit, shown here, emerges mysteriously from the tree. The folds of the willow spirit’s dress become the roots of the tree and the spirit’s upheld arms become branches. 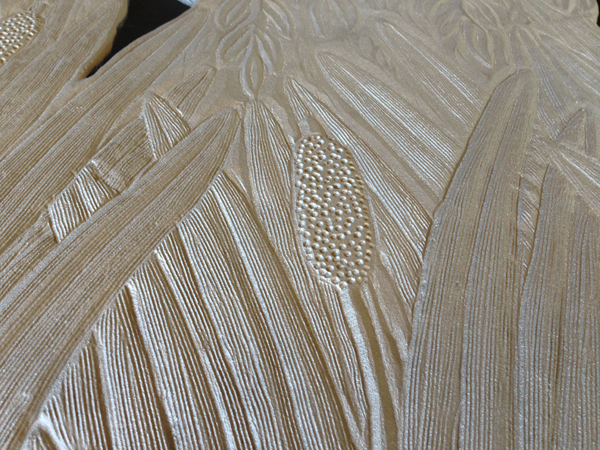 Detail of Paraje, depicting the willow marshes the artist discovered in the area during her research for the project. I wonder how much better if we could use tax dollars for things like a coffee stand instead. Another waste of tax dollars that could better be spent on IMPROVING BUS SERVICE! No one notices this “public art” at these places! Actually Metro’s “Art Tours” are very popular and there are more than a few photos on the Internet of art at Metro stations. In fact, here are a set of photos of an art tour this past Sunday of the Expo Line. Saying “no one notices” is simply not true. An artistic coffee stand does two things: brings the place to life AND it also brings revenue. There’s no reason why art has to be art and a coffee stand should just be a coffee stand. Why not incorporate both of them and accomplish art and revenue earning at the same time? Excellent point on coffee + art! I love the art of Alison Saar….this sculpture will inspire generations. An artsy garbage can or a bench. An artsy TVM machine, digital display, Metro system map display holder, information booth, coffee stand, newspaper stand, etc. How about a theme for each station? Remodel the Little Tokyo station to have a Japanese theme to it, like having a Japanese tea stand instead of coffee stand. Remodel the Wilshire stations to have a Korean theme where they can have a Korean mini mart inside of it. Build the soon to be built LAX station for the Crenshaw Line with an airport theme to it. This alone does wonders to incorporate art and theme AND revenue to the system. Art by itself, one can go to a museum for that. If it’s an art for mass transit, then at least incorporate something useful along with it. As for “coffee stands”: a source of garbage, riders–you know the one–who have been indirectly encouraged to take drinks on board trains in violation of code and make a mess on the train (original video for subway safety points out specific intention NOT to have food places in metro stations for the above reason) and clutter and encouraging the WRONG people to hang out at the station with ulterior motives. A big part of safety or felling safe is knowing that all at the station have no other intention than riding the line. Now, coffee places just OUTside the station at TOD is just fine. I disagree that a station should only be used as a station. Should an airport terminal just be used as an airport terminal instead of having them also with duty free shops, restaurants, and vending machines? We need to encourage entrepreneurship, help the local economy, as well as bring in more revenue into the system by having convenient amenities at the stations while people wait for the train. We are should be utilizing whatever land space available, including within the station than just building stations with wide empty spaces. It’s like they never stepped a foot outside of Los Angeles or the US and have never visited other cities around the world and see what mass transit is like elsewhere. Hello. Exactly, isn’t LA already known as the concrete jungle. I have never been to Europe but someone paid for the character and ambiance their cities project. Even Las Vegas has a certain feel. LA is strip malls and concrete. In Boston, we have newspaper stands, we sell bottled drinks, we have several shops within our stations and they all do just fine. I think a lot of Angelenos who pretend to know stuff about mass transit could spend their times outside of LA once in a while to see how mass transit is done elsewhere. As Kimberly mentioned, if they spent the extra time to Google stuff like how we name our stations by locality than intersections or how we build our stations with both art and retail space in mind, or even how other cities around the world uses technology and even different fare systems, they will have their eyes opened how little they know about how mass transit works elsewhere and how far behind LA is to catch up with the rest of the world. I doubt majority of the people who say things like “nobody names stations after localities” or “stations should be just stations, nothing else” or “no one uses distance fares because it’s too complicated” have even bothered to get an US Passport to travel outside of this country. You can’t assume things you don’t know about unless you actually see them first hand. This is a nice artwork. But I have a general criticism of the “Arts in Transit” programs. Lately, the “arts for transit” have mostly been standalone artworks, separate from and not integrated with the stations. This kind of misses the point. The City Beautiful movement called for each station to *be* an artwork, and that is what Arts in Transit should do. We still need art for the Metro Silver Line at the remaining 7 stations..